The Galaxy E7 comes in your typical Samsung retail box, only for the E-series a green color has been chosen. Inside you'll find the phone itself on top, and a standard set of accessories underneath. There's an AC adapter, which outputs 1.55A of current at 5V and a separate USB-to-microUSB cable. You also get an in-ear headset with a three-button remote, but no flat cords. The 5.5-inch Samsung Galaxy E7 measures 151.3 x 77.2 x 7.3mm, which is pretty standard. It feels thin, despite being a whole millimeter thicker than the more upmarket Galaxy A7. At 141g, it weighs the same as the premium offering, meaning it's quite light, while packing a 2,950mAh battery. A similarly powered Asus Zenfone 2 tips the scales at 170g. Take the Galaxy A7, replace its finely machined metal frame with plastic, add a few millimeters to the corner radius and you get the Galaxy E7. You can't mistake the E7 for a smartphone originating from any different brand, it has Samsung written all over it, quite literally. The frame does try to pose for brushed aluminum and may fool the unsuspecting observer from a distance, but from up-close it's clear that it's an impostor. It looks the part while new, but judging by our experience with previous similar designs from Samsung (Note 3 comes to mind), the coating will hardly keep its best shape over time. The frame also sticks up a fraction of a millimeter above the display, which may not offer the most pleasant feeling, but provides a minor degree of extra protection for the front glass. Speaking of, you may want to pick up a screen protector, glass or otherwise, as there's no Gorilla Glass treatment on the Galaxy E7 to keep it safe. The front is dominated by the 5.5-inch Super AMOLED panel, surrounded by decently sized bezels. The bezels sport a striped pattern as opposed to the dotted one on the A-series, Samsung apparently likes to use different patterns for the different ranges. The back cover is non-removable although the miniscule gap between it and the frame may lead you to believe it is. It has a pearl-like effect, it's soft to the touch and it will happily keep fingerprints away. The Galaxy E7 has exactly the same control layout as its more upmarket sibling. You don't get a Samsung smartphone without a hardware home button and this one is no different. It's flanked by two capacitive buttons, a Task switcher on the left and a Back button on the right. Above the display there's the earpiece, joined by the proximity sensor and the front facing camera. There's no ambient light sensor, but more on that in the display chapter. Around the back, there's the familiar arrangement introduced with the Galaxy S3 back in the day. The main camera is in the center and it is flanked by a single LED flash on the left and a speaker on the right. 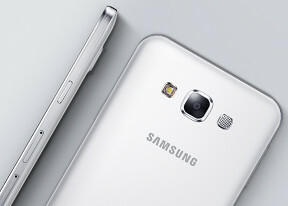 The camera lens bulges a millimeter, though not as pronounced as on the Galaxy A7, which itself is thinner. The right side is home to the power button towards the top third. Midway is the combined SIM/microSD slot and the main SIM slot is further down. Both slots accept nano-SIM cards and you get either a second SIM or a microSD card but not both at the same time. On the left you'll find nothing but the volume rocker. The microUSB 2.0 port is dead center on the bottom, joined by the standard 3.5mm audio jack and the primary mic further to the right. On top there's a lone pinhole for the secondary mic. The Galaxy E7 is no small device, that's for sure. But anything with a 5.5-inch display was going to be big. So if you're on the lookout for a phablet, you have already accepted that you won't be able to reach the entire area of the screen, when working single-handedly. With that out the way, the Galaxy E7 is actually quite pleasant to handle. The slim profile suggests you're holding a higher-end device and together with the low weight means that the smartphone won't be a burden on your pocket or purse. We'll proceed with a detailed look on the smartphone's display and battery autonomy.